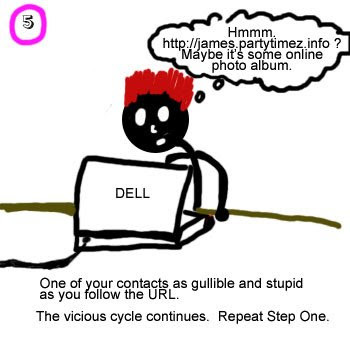 Right up your alley: How to solve this pesky MSN "Virus" - partytimez.info - Illustrated! How to solve this pesky MSN "Virus" - partytimez.info - Illustrated! There is a MSN "Virus" going around, which automatically sends messages to the rest of your MSN contacts with the following: http://your_email.partytimez.info, and I have fallen victim to it, very much thanks to a friend. It is not a virus, really. I wouldn't call it a virus, because it doesn't affect your computer system, doesn't affect your registry at all: it simply irritates the hell out of your friends (and the rest of the beings you have bothered to keep on your MSN contact list even when you hardly speak to them). Should I uninstall MSN Messenger? Some people would advice you to uninstall MSN Messenger from your computer, and reinstall it again. NO WAI (LOLSpeak), ignore them, that wouldn't work, I can tell you. I've tried troubleshooting the problem by using a Web-based Messenger service (Meebo) being one of the better ones out there ). After awhile on the Web Messenger, I was logged out from it automatically once again, mass-sending my contacts the same irritating message. From then I knew that it wasn't a glitch occuring in my computer. So, what's the problem, then? It took me awhile to resolve this problem: a friend fell victim to this "virus" as well, and he was whining to me so much about it, which was really unattractive because whining isn't exactly something a guy is entitled to do. Instead of joining him in the whining, I googled for the solution, and found somebody's suggestion on Yahoo! Answers. There are really a lack of articles around to explain to you, and help you resolve this "virus" problem. Since I'm a really helpful person, I've (literally) illustrate the matter further. here's what really happens, painstakingly illustrated. Apparently it's a phishing attempt by the web page to get your login ID and password. That is why even when you are offline, the 'virus' is able to your log into your MSN account and sends everyone in your contact list the same message containing the partytimez.info URL over and over again. Solving the problem to the partytimez.info problem is pretty easy: simply change the password to the email you use for your MSN account. Because your new password wouldn't tally with the old one which the website managed to 'phish' from you, the 'robot' they have built wouldn't be able to log in automatically to your MSN Messenger anymore. Apparently there are other bots that does the same thing as what the fellas at partytimez.info do, so you can try the same method to solve the problem. I figured I'll have to write a blog entry about it, because alot of people will be affected by this. Leave a message, if this helps! This just happened to me! Except I didn't type in my userid and password so I didn't know that was what it was doing. Anyway, advise affected people to change all your passwords which are the same as that lost MSN password too.. 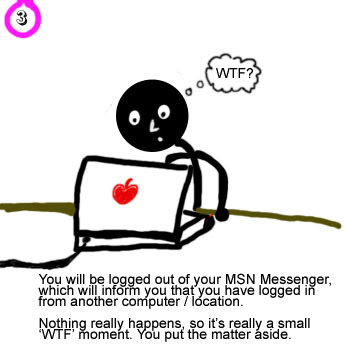 I wonder if it happens to someone who isn't using the hotmail account as a msn login. 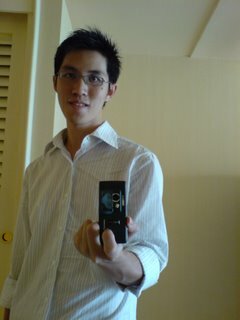 I click on the link sent to me but it didn't ask me for my msn login or pwd. something like the virus you meant just hit my PC although your post was 3 years ago .. i changed my password but it changed nothing .. can you help me ? J3n91: If you've changed your password, I would assume that you might it might be. You can try these different methods. 1. Logging into MSN Messenger on your friend's computer, and see whether the same problem occurs. 2. Logging into a web-based messenger service, such as meebo.com, and see whether the same problem occurs. If you don't have similar problems when you've tried the methods above, I would think that it's your computer system. You can send me a screenshot of the problem if you want. Thanks!